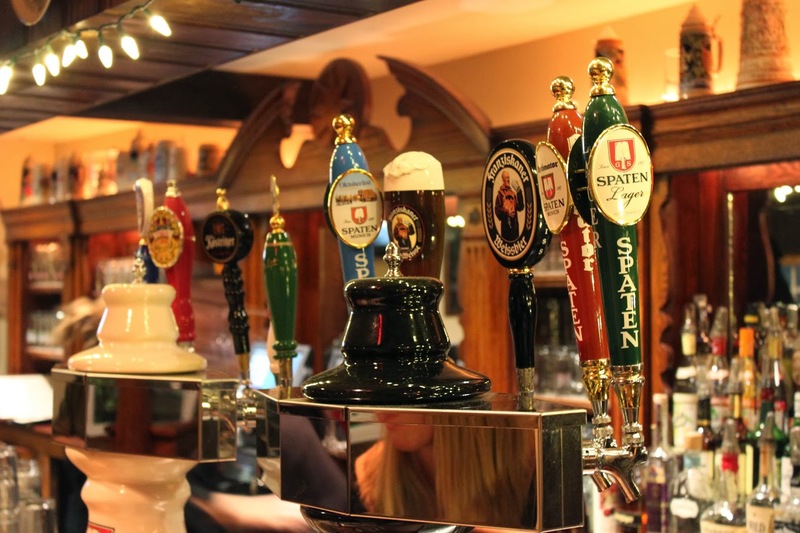 Last weekend, we braved the snow covered roads and headed to one of our Annapolis favorites, Old Stein Inn. Old Stein makes the illustrious list of Annapolis area restaurants Nathan and Casey will actually drive to (the list also includes Lures and the dearly departed Punk’s). The food is always delicious and the German beer selection is always impressive. In fact, after multiple trips to Germany and Austria (hell, Nathan even lived in Germany for a year), this is the best German restaurant we’ve been to in the United States. Spaten Lager – A very “meh” lager. Spaten Oktoberfestbier – A good and malty Oktoberfest standby. Spaten Optimater – A rich, malty dopplebock and a classic of the style! Kostrizer Schwarzbier – An ok black lager; it’s no Ugly Pug. Reissdorf Kölsch – A refreshing alternative to a lager and a specialty of Köln (Cologne), Germany. Franziskaner Hefeweizen – A yummy Hefe with banana and clove. A Bavarian specialty that’s traditionally drank in the summer. Franziskaner Dunkelweizen – A good, dark version of a Hefeweizen that and some dark malt complexity to the banana and clove of the traditional Hefewezien. Lindeman’s Frambois – An overly sweet “lambic” but worth a try. The 10th Tap – Is always rotating, usually matches the season, and generally isn’t available on draft anywhere else; this weekend we enjoyed Einbecker’s Winter Bock. Don’t let it seduce you! Look at the bottle list! Old Stein has a great and often overlooked bottle list too. It’s ever evolving and represents most of the traditional German styles of beer. A lot of these offerings are also hard to find. 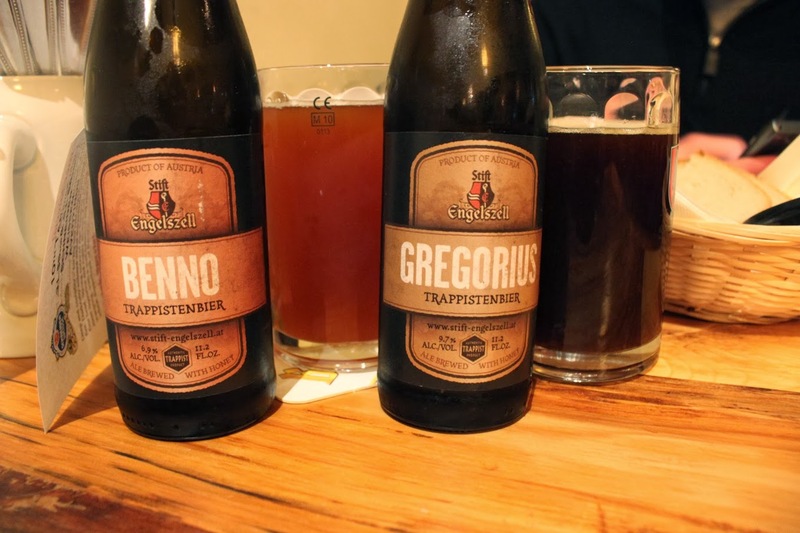 For example, we stumbled across the little known Austrian Trappist beers from the Engelszell Abbey. Engelszell makes two beers–Gregorius, a big, roasty quad with hints of dark honey, and Benno, a spicy “abbey farmhouse style” beer with a delicious candy apple finish. Granted, due to my Austrian heritage, I’m a little partial to all things Austrian–well, not all…to be clear, that Hitler guy wasn’t so great–but the Austrian Trappists are taking these traditional Belgian styles and adding deliciously complex new twists. If you’re growing tired of the same old Quad or Dubbel, check these beers out! You’ll be pleasantly surprised. Plus, the Gregorius paired exceptionally well with the apple walnut cake (and cherry reduction) we had for dessert. These definitely live up to my expectations of a Trappist beer. Old Stein is also the only place we have been in Anne Arundel County where we have found German Gose (a light, slightly malty, tart, and salty beer made with a large amount of malted wheat), and Berliner Weiße (a sour, acidic, wheat beer from 16th Century Northern Germany). You seriously have to look at Old Stein’s bottle list. And speaking of the food…we’ve never had a bad meal. 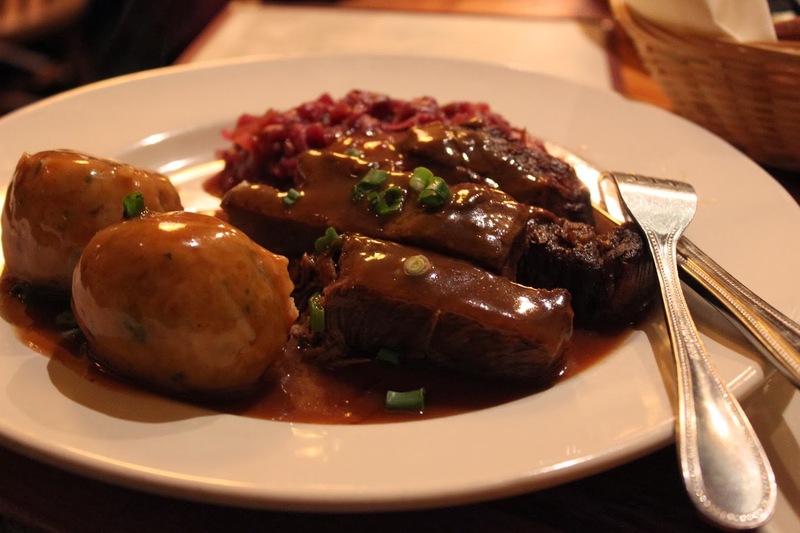 In the fall and winter, Old Stein usually offers a delicious selection of wild game dishes. Past selections have included Wild Boar Goulash, Elk Steak, and duck sausage (if you see it, get it. It will change your life). Because none of the specials tickled my fancy, I ordered the old standby, Sauerbraten; delicious and tender as always! I didn’t want to finish this because I didn’t want it to be gone. Nathan ordered the pork tenderloin special. It was stuffed with cheese, figs and walnuts. Super tasty! We also enjoyed sautéed foie gras over a potato pancake before our meal–scrumptiously decadent and well cooked. On the beer and food front, Old Stein never disappoints. Portions are generally huge, so come with an appetite, but save room for their great selection of German beer! OK, as a German native, I would have to agree to disagree with you on this place! At least as far as the food is concerned. This is NOT good, genuine German food!! Plus, it is totally overpriced (as is the beer, but at least, that is tasty :-). There are a couple of places in DC where can get better central-European food – none outstanding, but better than this place! I was thoroughly disappointed. Sorry! Du bist ganz richtig, aber dieser Amerikaner hat fast kein Deutsch gesprochen seit 2002. Definitely going to have to agree to disagree on this one. However, I will say that other than the sauerbraten I’m not the biggest fan of their standard menu. You really want to try out Old Stein when they have their wild game or other special menus. Some of the dishes are more German inspired than traditional fare, but are nonetheless very, very good. Yes, I would give it another try for wild game!! That seems to be almost impossible to get here in the US (at least for those of us who don’t like to shoot the poor critters ourselves :-). I was in Schwäbisch Gmünd. Not too far from Bavaria but definitely a different culture and cuisine.